It is utterly futile railing against kids wagging school. They have the moral high ground. We live in remarkable times. Last Friday young Australians joined 1.3 million schoolchildren in 1769 cities around the world to announce a big fat failure for their elders. In Australia an estimated 150,000 students, including tens of thousands in each of the bigger state capitals, abandoned their classrooms and took to the streets in an unprecedented show of defiance and anger over multiple governments’ indifference to the climate crisis. 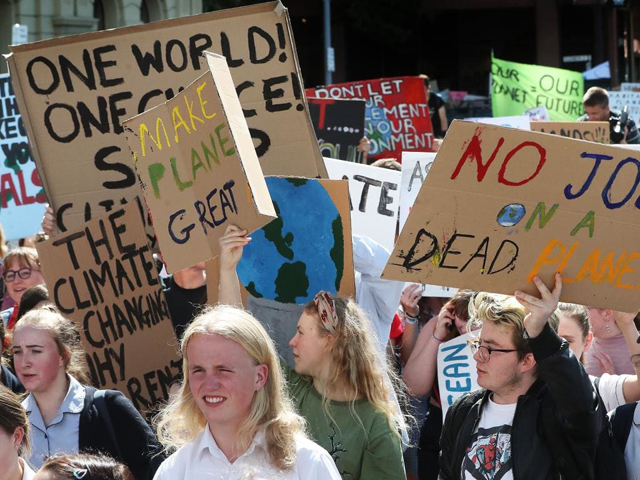 In Hobart and Launceston the young came out in their thousands – according to organisers between 6000 and 8000 in Hobart alone – to vent their frustration. There were no mass-produced placards as you tend to see at adult demonstrations. Theirs were crafted by hand, illustrated with burning Earths, rising seas and frightened wildlife. Straight from the heart, they expressed the anguish and anxiety being felt by children today. There were adults sprinkled through the Hobart audience on the lawns of Parliament House – parents and teachers among them – but numbers were overwhelmingly in favour of young people, who organised and led the event. A poet’s song and mime gave life to her words, speakers expressed passion and conviction, and musical offerings included a primary school band performing its own composition on the world’s parlous state. I have seen many public demonstrations over the years; this was as good as it gets. Australian children have had a big part in this global movement. Last November they turned a Swedish schoolgirl’s solitary protest into a mass movement by taking to capital city streets in a “School Strike 4 Climate”. Now it is huge, and will only get bigger. I was a dutiful school student and looked askance at odd fringe individuals who wagged classes (while secretly admiring them for their defiance). But their successors are in another league altogether. Their defiance is entirely justified, and elders’ complaints utterly pointless. If she had wanted attention, she got it. Hundreds of responses argued that education and school are not synonymous, and that informed protest is a valuable learning experience. November’s demonstrations were hard to take for Scott Morrison, who called for more learning and less activism in schools. The PM might have learned something from the rubbishing he got over that, because he remained mercifully silent about last week’s event. Others not so. Tasmanian energy minister Guy Barnett thought students should not protest in school hours, as did Labor leader Bill Shorten, while qualifying that this was “in an ideal world”. But as a union man he should have known that strikes are all about withdrawing labour. Each and every politician who talked down the students’ actions ended up looking like a fading generation. The youth of the world are in this for the long haul. As one of the Hobart speakers said, “We’re 25 per cent of the population, but we’re 100 per cent of the future”. Elders may lament the loss of the good old days. The problem is, as expressed by that 16-year-old Swedish schoolgirl, Greta Thunberg, those good times came with “an unthinkable price tag”. Last week, asked how she felt about her nomination by two Norwegian lawmakers for a Nobel Peace Prize, she fumbled for words, not knowing what to think. “At places like Davos, people like to tell success stories, but their financial success has come with an unthinkable price tag… The bigger your carbon footprint is, the bigger your moral duty. The bigger your platform, the bigger your responsibility. Our children should know this: large numbers of ordinary adults are grateful for their courage in calling out the incompetence and indifference of our leaders. Never give up.